Looking for some pep rally ideas to get the entire school involved in supporting your athletic teams? 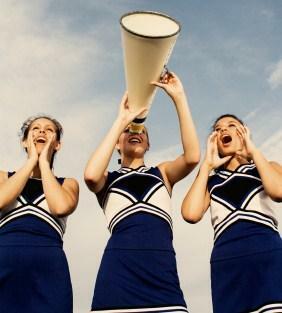 Keep reading, and you'll find tips for planning the perfect pep rally, along with ideas to ensure that every student leaves excited about coming out to the big game. You cannot hold a pep rally for every single basketball game or football game. If you attend a large high school with numerous sports, you also want to be careful to make sure that all athletes get recognition at some point during the year. Once during the fall for the big homecoming game. Although football will be the feature here, make sure that other fall athletes are recognized. Once during the winter season for winter athletes. Once during the Spring season. Many schools have a spirit week, and this would be an ideal time to have a pep rally. Once at the end of the year. Of course you can do more than four per year. On the other hand, remember that the administration of the school has to be on board and in favor of having a pep rally, and they are unlikely to approve more than a few. One of the great things about fall is that there is so much to celebrate. In general, a fall pep rally will be tied to Homecoming. This is a great time to hold class competitions as well as honor athletes who have gone before you. Do a little research, and see if you can find a former athlete alumni who is willing to come and officiate the pep rally. Whatever your homecoming theme is, the pep rally should follow suit. Have upperclassman vs. underclassman competitions. Have a "powder puff" bowl where the football players dress as cheerleaders and the cheerleaders dress as football players. Have a battle of the sports where players of various teams switch places. For example, football players play field hockey and vice versa. Have a raffle for pizza or lunch at some place nearby the school. Have each class show off either a class float, class hallway or class wall. Use whatever space you have, and have each class come up with a theme. Plan a procession of the homecoming court. You can throw a great pep rally based on a winter and winter sports theme. If you can, think about decorating with white lights and white or glittery silver decorations. Performing a cheerleading routine to white lights is also a great idea, and a really cool visual effect. Have a gingerbread building competition. (Use graham crackers, white frosting, and M&Ms. Throw candy at the section of the gym that cheers the loudest. Have your own version of the Class Iditarod; let students attempt to make their fastest version of a sled (pulled by other students) using only certain materials like rope, garbage bags, etc. Have the race outside on a field or make sure that your materials won't scratch the gym floor. If your cheerleading squad competes, a competition is undoubtedly right around the corner. Why not wow the crowd with your competition routine? It will be good practice before you do it in front of the judges. If your school is having a spring play, ask the actors to do a quick scene. Chubby bunny (in honor of Easter) is always a crowd pleaser. Honor your graduates with a special pep rally just for them! Make sure to mention graduating athletes and any of their achievements. Present them with a special plaque or trophy. Fill a plastic swimming pool with water and ice. Freeze plastic coins into some of the ice cubes and have your seniors bob for "college scholarship money". Throughout the year, collect newspaper clips and video for an end of the year "sports highlights". You can have these made into a slide show so that the entire school can enjoy the year's highlights and bloopers. Make sure that you clear your plans with your advisor or the appropriate school officials. Make sure that you are creative, and don't follow the same routine for each pep rally. If students know exactly what to expect, they're not going to be excited about coming. Make sure that you thank anyone who helped you pull it off either publicly or with handwritten thank you notes. You'd be surprised how far a little gratitude will take you!